Reverend Guimo's Blog: The "Looking for a Girlfriend"-guy and "This Man"... is there a connection? The "Looking for a Girlfriend"-guy and "This Man"... is there a connection? 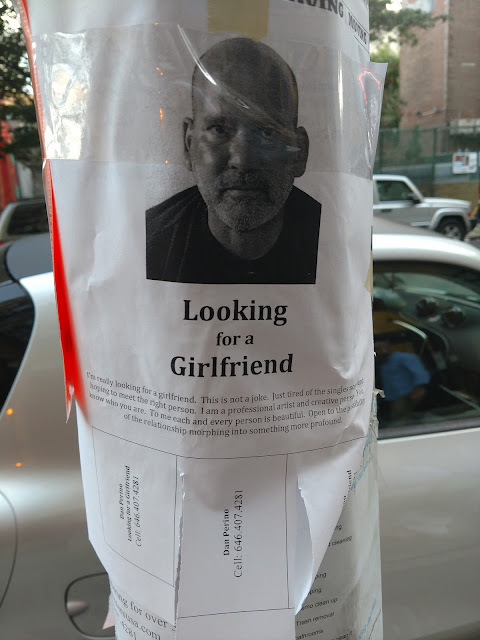 So a few years ago flyers started appearing around the Lower East Side saying "Looking for a Girlfriend" under the vaguely mugshot like picture. The flyer mentioned he was an artist so I thought this was some sort of way to get attention for his work because it's kind of strange to look for companionship in this way; but it turned out he was kind of serious about it. The last time I saw these flyers must have been like two years ago, then I quickly forgot all about them until yesterday when I was walking home and I saw a freshly posted flyer with the same picture and statement. I wonder if he did manage to find a girlfriend for a time but now he's looking for a new one. Or maybe he took a break from trying to find a girlfriend, and now he's trying to get his groove back. Who knows! That man also reminded me of "This Man". 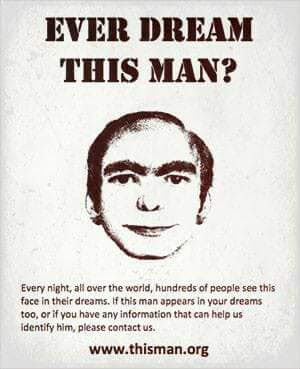 If I'm not mistaken, "This Man" was created by a socialologist in the 1960's to see how quickly an image could spread (or something like that), and in recent years "This Man" has made a comeback. I wonder if "This Man" is looking for a girlfriend too. I hope they both find someone someday.